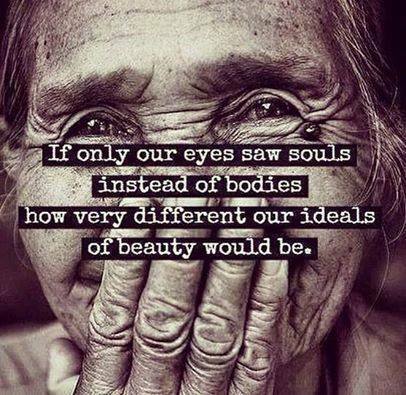 As the old saying goes ‘Beauty is only skin deep’ and it is oh so true. If only we could peel back the outer layer of everyone we meet and connect directly with their heart and their soul, we would make perfect connections and see the real person inside the human cover. Connecting heart to heart and soul to soul would teach us so much and our understanding re the needs and wishes of the other person would not be tainted with what we see through our very ‘Ego centric eyes’, he/she is handsome, beautiful, fat, thin, ugly, pretty, smart, scruffy, black, white, yellow, brown, short, tall, blond, brunette, bald, etc, we would truly feel the other person and connect as connections should be made, deeply through the heart and to the soul. Our world, I am sure would be a happier place, a more peaceful place. There would and always will be differences of opinion I’m sure, misunderstandings, cross cultural differences of some sort but I do feel that all in all, our lives, our communications and the relationships forged would be better and stronger than they are now. ← Choose Happiness, because it makes you feel Alive! Me too Barbara….have to reblog this one Mark. Made me happy this morning..even teary! So happy people like you, Barbara and so many others are coming forth with torches of light – love – in this world! Love and a hug back to you through the wires.